Hockey, under the influence of our Canadian neighbors, enjoyed pockets of support by the University at Buffalo through the years. According to Volume I of the Iris Yearbook, the first U.B. hockey team was organized in the winter of 1895-1896. The sport continued for a few years and then was abandoned for lack of interest. It was revived briefly in the 1920’s and faded again. In 1962, a team was formed that played at the club level and in 1969-70 it became an official varsity sport. In the late spring of 1987, the University decided to discontinue it as a varsity sport and it is now played at the club level. 1895 – 1896 – The organization of the first team at U. B. occurred in the winter of 1895 – 1896 through the efforts of lrving R. Johnson of the Department of Medicine. Though in its infancy, the team had a very successful season, playing several local teams and winning 75% of their games. The original team was as follows : Johnson, Medical, ’98, (Captain); Hall, Medical, ’98; Diller, Medical, ’99; Peck, Dental, ’98; Cursons, Dental, ’99: Camper, Medical, ‘ 97; Young, Dental, ’98; Howell, Dental, ’98; Parker, Medical, ’97. 1896 – 1897 – The success of the first season aroused interest in the sport and in 1896 a strong team was organized, being recruited mainly from the Department of Dentistry, and composed of experienced players, who had early training in Canadian schools. Under the management of Dr. Conrad E. Wettlaufer of the Department of Dentistry, a series of games was scheduled with the more prominent neighboring teams, among them being St. Catherines, who were the foremost of the Intermediate Series of the Canadian Clubs. Charles Peck as captain of the team. These games attracted great notice, and the Buffalo devotees of the sport were rejoiced to see their contingent go through the season’s schedule without meeting defeat. 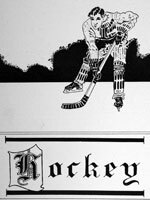 1899 – 1900 – Buffalo City Champions – The winter of 1900 saw the University of Buffalo hockey team participating in the Buffalo Hockey Association, a new hockey league. The Buffalo Hockey Association (B.H.A.) consisted of several local hockey club and the University of Buffalo. The U.B. team won the cup as city champions of the senior division. The U.B. team capped their season by defeating Cornell University by the overwhelming score of 10-1 at the Broadway Rink in Buffalo on March 22, 1900. 1900 – 1901 – Game played with the University of Toronto was the highlight of the season. 1901 – 1902 – Games were played with Cornell, Cleveland and Toronto Varsity. MANAGER: Dr. Conrad E. Wettlaufer. 1903 – 1904 – In December a meeting was held in the amphitheater of the Dental Department to decide what could be done to organize a hockey team in U. of B. 1918 – 1919 – The revival of hockey occurred in the winter of 1918 – 1919 through the efforts of E. J. Weisenheimer, Dent ; H. A. LaBurt, Medic; F. Farrow, Medic; N. Chassin, Law. 1919 – 1920 – Hockey had its representatives from the University, and although not victorious good games were played with Welland, Cornell and others of high calibre. Manager Chassin had his puck chasers in good form, and a better year is looked for in 1920-21. 1922 – 1923 – Hockey was reorganized this year and put on a permanently sound basis. In the latter part of January a meeting for the reorganization of a hockey team was called and all former players and new candidates were asked to attend. Graduate manager, W. J. Blackburn, presided. Officers were elected and the sport received the official stamp. The former players who attended were; E. J. Weisenheimer, Dent ; H. A. LaBurt, Medic; F. Farrow, Medic; N. Chassin, Law; all members of the first 1918-1919 team. J. Denneen, Dent; W. Schintzius, Medic; J. Waugh, Arts and F. Haft, Medic of subsequent teams. The new candidates that attended were ; D. Scanwell, Law; H. A. Deonell, Medic; G. Gleason, Law; D . Foss, Medic; L. Lapi, Medic; J. E. McGrath, Dent; M. W. Klein, Dent; C. T. Meyers, Dent; R. S. Elster, Arts; B. Burns, Dent; D. O’Neil, Dent. 1946- 1947 – U.B. Mavericks – In 1946-1947, after World War II, the students of the University of Buffalo’s School of Physical Education organized a “club” hockey team and called themselves the Mavericks. 1947 – 1948 – The U.B. Mavericks hockey team again played in the Buffalo Municipal Hockey league finishing fourth in the league standings. 1962 – 1963 – Hockey Returns – Hockey at the University begins again at the “club” level, meaning it received no funds from the Athletic Department. It was student run, with no recruiting. Anyone who wanted to skate for Buffalo had to foot his own bill, usually $25 per man. The Bulls played teams from the Buffalo Muny League and from the newly formed Finger Lakes Collegiate Hockey League. Star players included center Dan Gorney, goalie Ken Sherry, winger Jerry Doherty and defenseman John Cimba. 1963 – 1964 – Praised in Sports Illustrated – The Hockey Bulls were officially accepted into the Finger Lakes Collegiate Hockey League and received financial support from the athletics department. The team wound up with a 9 won, 2 lost, 1 tie record and a second place finish in the league. 1964 – 1965 – The hockey club’s desire for varsity recognition increased with every victory in the 1965 season encouraged by larger student body support at home games. The team was coached by Karl Balland and the club’s captain was senior Jerry Doherty. Goalie Ken Sherry was one of the best in the Finger Lakes Collegiate Hockey League. 1965 – 1966 – The University of Buffalo Hockey Team opened its 1965-66 season with a new coach and missing four graduated All-League players, but the ice Bulls were still rated among the favorites in the Finger Lakes Collegiate Hockey League. Coach Day Hannah, Sr. lead a core group that included Dan Gorney, Fred Cohen, Day Hannah, Jr., Tom Robertson, Kevin McCullough and Al Dever. 1966 – 1967 – Charles H. “Trey” Coley III joined the program as head coach helping the club win their first Finger Lakes Collegiate Hockey League tournament bid. Born in Buffalo, Trey Coley attended Nichols School, where he was a captain in three sports — football, hockey and baseball. He was a graduate of Colgate University. Lead by captain Al Dever, the Bulls waged a season long battle with Ithaca and R.I.T. for third position in the Finger Lakes Collegiate Hockey League. Sparkling in net was freshman goalie Jim Hamilton who averaged over 40 saves per game and registered a shutout over Syracuse. 1967 – 1968 – Undefeated Regular Season – Lead again by “Trey” Coley, the hockey club team went 15-0 during the regular season and won the Finger Lakes Collegiate Hockey League. The club hosts their first Finger Lakes Collegiate Hockey League Invitation Tournament and lost the title to rival Oswego State 5-4 in overtime. Leading the team was LW Lorne Rombough with 38 goals and 18 assists. 1968 – 1969 – Under the direction of new coach Steve Newman, the hockey Bulls, playing exciting hockey, skated to a 19-5-0 overall record losing the Finger Lakes Collegiate Hockey League Invitation Tournament championship to Canton Tech, 3-2. Leading scorer was left wing Tom Caruso with 22 goals, 21 assists for 41 points. Goalie Mike Dunn turned in a credible season performance with many fantastic saves. 1969 – 1970 – Official Varsity Sport – The team became an official varsity sport under the governance of the Athletic Department. Buffalo won their first official game as a varsity sport, whipping Ithaca College 8-0. Al “Bibber” O’Hearn coached the team most of the way through a 17 game slate. The Bulls would lose the Finger Lakes Collegiate Hockey League Invitation Tournament again to Canton Tech. 1970 – 1971- Hockey Comes a Long Way – Ed Wright, a Boston University grad, becomes U.B.’s first full-time professional hockey coach. A native of Chatham, Ontario, Wright was the first Black collegiate ice hockey coach in the country and instantly accomplishes two major achievements: a competitive schedule and a basic recruitment program. 1977 – 1978 – The All-American Era – With no Canadians on the roster, the Bulls were known as the “All-Americans” and the team becomes a charter member of the New York Collegiate Hockey Association (NYCHA). 1978 – 1979 – The team joins the State University of New York Athletic Conference (SUNYAC). 1981 – 1982 – John Mickler replaces coach Ed Wright who takes a year’s leave of absence to resume his studies for a doctorate degree. Mickler was active in Western New York youth hockey as a coach and an administrator for several years. He owned the Buffalo Blades in the New York Penn Junior Hockey League in the mid 1970’s. 1982 – 1983 – John Mickler takes over the coaching duties on a permanent basis. 1986 – 1987 – In March of 1986, John Mickler resigns as the head coach of the hockey program. In five seasons, Mickler’s teams posted a 33-90-3 record. Ed Wright reluctantly agrees to coach the team again. 1987 – In the spring of 1987, hockey is discontinued as an official varsity sport at the University. It continues on at the club level.